Last week Norway’s farmers demanded more than NOK 1.4 billion in state subsidy and other financial support. On Friday the state responded, with an offer that cuts the farmers’ demands by more than NOK 1 billion but still offers income growth higher than in most other work groups. Leif Forsell, the longtime leader of the state’s annual negotiations with the farmers’ two major organizations, handed over an offer amounting to NOK 410 million. The state noted that income growth within the agricultural sector has amounted to 18.1 percent from 2014 to 2017, while wage and salary development for other groups in the same period has been just 7.1 percent. The state’s new offer, according to the Ministry of Agriculture, will add another 2.25 percent to the farmers’ income from 2017 to 2018. The ministry further noted that over-production in the years 2015 to 2017 led to farm losses of around NOK 350 million. Income growth in the year ahead, according to state officials, can thus improve considerably if the farmers do a better job of gauging production to market needs. Forsell reminded the leaders of both Norges Bondelag (The Norwegian Farmers Union) and Småbrukarlaget that finding the right market balance is their responsibility. He further noted that there’s just as much need for moderation in income growth among farmers as in other sectors of the Norwegian economy, which is recovering from the oil price collapse in 2014 when many industrial workers lost their jobs. Norwegian Broadcasting (NRK) reported that Forsell was also unhappy that the farmers expected fully NOK 1.3 billion of their demand to be finance directly through the state budget, in pure subsidy, while only NOK 150 million would be raised by boosting food prices. The state isn’t keen on being responsible for higher food prices either, so is unlikely to boost them. That means the state’s offer of NOK 410 million would likely involve around NOK 260 million in state funding. The state’s offer includes an increase of NOK 55 million in funds allocated for farm investment, NOK 5 million more than farmers wanted, with young farmers under the age of 35 to be given priority. The state stressed that its offer this year was higher than what Norges Bondelag accepted in 2015 and 2016. Negotiations will now begin and they’re expected to be difficult as usual. 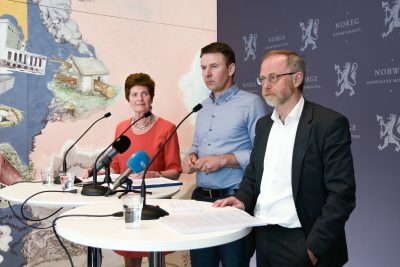 The farmers are rarely if ever satisfied with the state support they receive, and Lars Petter Bartnes, leader of Norges Bondelag, quickly claimed that the offer did not meet the biggest challenges in Norwegian agriculture. He also said it would not help small- and medium-sized farmers around the country. Merete Furuberg, leader of Småbrukarlaget, claimed the offer did not follow up the Parliament’s income targets on narrowing a gap between agriculture and other groups. “That’s highly unfortunate,” she said. A deal is supposed to be sealed by May 15, but it’s unlikely that deadline will be met. The farmers’ demands would have given them income growth of 9 percent this year, more than three times the 2.4 percent granted on average in other sectors.